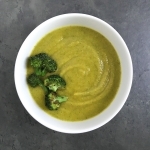 This healthy broccoli soup recipe is a dairy-free version of the classic broccoli and cheese soup. Think wholesome vegetables, pureed to creamy perfection. Tip! Chop all the vegetables prior to cooking as this is a fast-paced recipe. Peel and chop the potato last to minimize browning or keep cut potatoes submerged in a bowl filled with cold water. Simply drain before adding to the soup. In a large Dutch oven or soup pot, heat olive oil over medium heat. Add the onion and a few pinches salt. Cook for 2 to 3 minutes or until the onion has softened. Add the carrot, celery and potato. Stirring frequently, cook for 3 to 5 minutes or until the vegetables have softened. Stir in the garlic and salt; cook until fragrant, about 30 seconds to 1 minute. Pour in 3 1/2 cups vegetable broth and bring to a gentle boil over medium-high heat. Reduce the heat and simmer uncovered until the vegetables are tender, about 5 to 10 minutes. Add the broccoli (don’t worry, not all of the broccoli will be submerged). Simmer uncovered, stirring frequently, until the broccoli is tender, about 3 to 5 minutes. Don’t overcook the broccoli or it will loose its green coloring, turning the soup yellowish brown. Remove from heat and let cool slightly. Using an immersion blender or a high-powered blender, puree the soup until smooth (be careful, the soup’s steam will be hot). If the soup is too thick, thin the soup by pouring in additional broth (or water), in small increments, until the desired consistency is achieved. Return the pureed soup to the pot and stir in the sherry vinegar or lemon juice, salt and freshly ground black pepper. Garnish with optional Broccoli Croutons. Refrigerate leftover soup in an airtight container for up to 4 days. In a small bowl, toss the broccoli florets in oil, salt, black pepper and optional garlic powder. Bake for 10 to 13 minutes, or until the broccoli florets have browned on the underside. Make It Oil-Free: Replace the olive oil with 1/4 cup vegetable broth or water. Add additional amounts, in 1 to 2 tablespoon increments, as needed during the cooking process to prevent sticking. Serve these healthy broccoli soup bowls with a side sandwich, salad or this Black Bean and Mushroom Vegan Loaf.